I’m an old guy now, 81 years. When I put up my first fitness website many years ago, I was a relatively young senior who aimed at a core audience of people at age 50 and above, people I defined as seniors. If 50 was the eligible age for AARP membership, which it is, it seemed a reasonable place for me to draw the line as well. At the time someone had written: “Fifty is the youth of old age.” That always sounded about right to me. In our 50s, most people can still handle some pretty intense training, once we’ve gotten through the beginner stage. 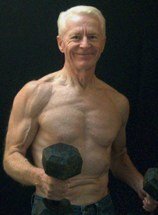 In our 60s, some can still maintain a pretty high level of training, lifting heavy iron, etc. In our 70s, or more, our bodies tend to tell us that age-appropriate training becomes more and more important. For years, I kept pretty good training logs and can look back and compare my abilities in my late 50s with today. At 81, I’m a shadow of who I was at 50, which should surprise no one. The other day, I was talking to my son-in-law who is challenging himself by training to do 100 non-stop pushups, in good form. I told him that as a young Marine I could do it. Today, I can’t even imagine it. Still, I’m grateful to be physically active and enjoying life. This reminds me of a good story that a subscriber once sent me. I’ve probably told it before, but I’ll repeat it because it’s a good one. A doctor on his morning walk noticed an old lady sitting on her front step smoking a cigar. Though very elderly, she seemed quite happy with herself and obviously enjoying her stogy. So he walked up to her and said, "I couldn't help but notice how happy you look! What is your secret?" "Well,” she said, “I do smoke several of these cigars every day. I just love 'em. And before I go to bed, I usually smoke a nice big joint. I also like Jack Daniels a lot . . . and, frankly, I’m not careful about my diet. I eat junk food. On weekends, I pop a few happy pills. And in case you’re wondering, I don't exercise at all." Meanwhile, senior health club memberships are growing faster than any other age category, as most of us are treating ourselves a little better than The Cigar Lady. It is sarcopenia, the wasting away of muscle that robs seniors of strength, balance and, eventually, their independence. Resistance training — weights, resistance bands and bodyweight calisthenics — is the antidote to sarcopenia. Senior training should include some portion of resistance work, some portion of cardio, and some portion of flexibility training. Ideally, resistance training should be the heart of the program. In case anyone is wondering, I don’t think following The Cigar Lady’s lifestyle will do the trick. When it comes to "Old School" training, the Clean & Press immediately comes to mind. It's one of the great full-body movements that challenges and builds most of your body's pulling and pushing muscles in a single exercise. If you haven't used this exercise lately, watch a short video and description of proper form . . . and then give it a try. Few lifts will give you more bang-for-your-buck than the Clean & Press. To your fitness and good health.